Afro Ken is a Japanese character created by the San-X company, which creates other anime-style characters such as Kogepan. He is a dog with a rainbow-coloured afro. He is innocent and blameless and always in a good mood. Afro Ken is always willing to try new things. Afro Ken is attracted to objects that look like he does. His hair changes to look like these things as he gets close to them. There is an Afro Ken Family Tree with other dog characters who have outrageous names, such as Techno Ken, Funky Ken, Lord Ken, Super Afro Ken, and Normal Ken. Unlike the others, Normal Ken does not have wild hair. Afro-Ken is certainly a weird little OVA; it's not really about anything in particular, and yet still manages to be entertaining. 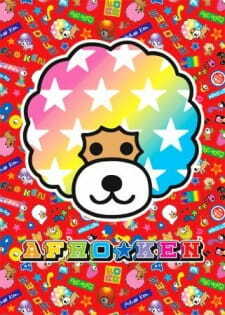 Based on a line of toys by the people who brought you Hello Kitty, Afro-Ken is about a cute dog with an afro and all of his friends, most of whom are also cute dogs with afros. The &quot;story&quot; introduces the different dogs and features silly little elements of their lives... and that's it. It's not really a story at all, but it does what it needs to do: look cute and advertise toys. And look cute and advertise toys it does. Afro-Ken covers dozens of unique character designs, but features little else in the way of characterization. On that note is the way these characters appear: the entire OVA is done in 3-D, but rather than going for a more realistic look, the animators appropriately chose a simplistic, silly style. While not particularly remarkable, (the movement of the dogs is often choppy) again, it does what it has to. That's not to say that Afro-Ken is without it's merits. The first lies in the music: the one prominent song (used for both the opening and closing) is fun and extremely catchy, with silly lyrics such as &quot;there is a dog with a big afro / that follows me around wherever I go / my daddy says it don't exist / but I can see it in the sky and even in my rice bowl dish&quot;. You gotta love it. The other good point of Afro-Ken? It is dang fun. You can't help but crack up at the jokes or &quot;awww&quot; at the cute little dogs with crazy hairstyles and their antics (my personal favorite is probably Afro-Ken swimming across a photo of the Statue of Liberty). As a matter of fact, this is one of the only anime that my three siblings and I all enjoyed, and it left us all wanting Afro-Kens of our own. It's certainly a pointless experience, but it's one of those shows that satisfies your need for the bizarre and the cute all at once, without confusing you or making you feel like you need more. And at one episode of less than thirty minutes, how can you deprive yourself of that? Afro-Ken is the story about a dog with an Afro. I don't need to go much further for you can see the plot would definitely not be good with those two elements. It is about him trying new things. And having an Afro. This is one majestic Afro, which brings us to the review. Story- There really is no story to this that matters, if there even was, it would make it worse, considering you can't have that good of a story in a one episode ova. That is why it gets a four. As I said, a story in a one episode show is pointless, but they didn't even try. Art- This is good 3d animation in this ova. They make Afro dogs very well. This is one of the good points of this anime. That is why it deserves a seven. Sound- The sound isn't all that memorable. In fact, it was so immemorial that I forgot it. With that much mediocrity, I shall give it a five. It didn't pierce my ears or anything, and the subs were ok, so it isn't below average or anything. Character- This is the major good point in the ova. I have never seen anything else with a dog that has a rainbow Afro. I've seen them with Afros, but no rainbow colored ones. Afro-Ken's Afro is a majestic one if I have ever seen one. And I have seen many Afros in my day. That is why I bought an Afro-Ken plush. He is truly adorable. That is why this section gets an eight. You can't mess with an Afro-Dog. Enjoyment- I really didn't enjoy this that much considering i am a teenager and this is meant for kids 10 and younger, but I don't think that any small child would like it either, for they wouldn't appreciate the Afro-ness and they would also be scared by the giant Afro-Dog roaming around. That is why this section gets a two. It scares little kids, teenagers find it boring, and adults would only watch it with their young kids. Overall- overall, this gets a four for lack of a story, immemorial sound, and scary to the target age group. Yet it isn't a one, for the adorable and awesome main character and the animation give it a few points. One of the best anime out there. Truly a masterpiece. I didn't know that Afro Ken lived back in the stone age. Didn't he go extinct? It's really a good documentary. I can recommend it. I laughed at that one joke for 4 minutes. And I just couldn't stop. To think that I only discovered it by accident. But I am happy I did. I think I will make an afro on my head. Yeah! Afro Ken did nothing wrong. So why did they cut his hair? That's animal abuse. It's about 30 minutes of a dog with an afro and random stuff happens. Really, even though it's a kids anime, it's epic. It's in 3D animation, also known as CG. Really, there's not really anything to predict what comes next. There is also a short part where the creator of Afro-Ken talks about Afro-Ken. It's really cute and funny at the same time. I really reccomend watching this.